What Else Can I Expect From an Online English Degree Program? English is a broad academic field that covers how the language is spoken, written, and interpreted. A versatile degree, students who graduate with a bachelor's in English will leave school prepared for a variety of career opportunities in the fine arts, business, education, and more. According to recent data from the National Center for Education Statistics (NCES), English is one of the most popular undergraduate majors in the United States, and more than 50,000 bachelor's degrees in English were conferred during the 2013-14 academic year. At some schools, English majors are required to choose a degree specialization. Students with a passion for reading and analysis may pursue a concentration in literature, while those with creative aspirations may pick creative writing or book publishing. Many English majors eventually become teachers in secondary and postsecondary schools, as well. Today, many students are choosing to earn their bachelor's degree in English online. Distance programs follow the same rigorous curriculum as classroom-based options, and lead to the same number of job opportunities after graduation. The asynchronous (or self-paced) structure of most online English degree programs is also ideal for students with part-time jobs, childcare duties and other commitments that may interfere with full-time on-campus learning. Read on to learn more about English as an academic discipline, and to discover what kind of career opportunities you can look forward to with an English degree. Professionals with a bachelor's in English are prepared for careers as technical writers, authors, journalists, editors, and associate publishers. Read more here..
WHAT CAN I DO WITH AN ENGLISH DEGREE BESIDES TEACH? An online bachelor's degree in English also prepares students for careers as technical writers, authors, journalists, and more. Read more here..
CAN YOU TEACH WITH AN ENGLISH DEGREE? Yes. Professionals with a bachelor's degree are prepared to teach at the high school level and lower after gaining teacher licensure. Graduates can also teach English to students of other languages around the world. Read more here..
HOW LONG DOES IT TAKE TO RECEIVE A BACHELOR'S DEGREE ONLINE IN ENGLISH? Most bachelor's degrees take about four years to complete, although accelerated options are available, which allow students to earn the degree quicker. For more accurate information, students should contact their prospective schools. Read more here..
WHAT DEGREE DO I NEED TO TEACH ENGLISH ABROAD? No degree is needed to teach English abroad. All professionals need to teach English abroad is TESOL/TESL/TEFL certification. Read more here..
WILL AN ONLINE ENGLISH DEGREE PROGRAM PROVIDE ME WITH THE SKILLS I NEED TO ADVANCE MY CAREER? Like many liberal arts programs, an English degree won't directly prepare you for many lines of work; you may be able to parlay your writing chops into a career in journalism or as a freelancer, but most graduates don't pursue a literary career. Instead, an English degree will help you build critical skills: you will learn how to read carefully and write effectively, naturally, but you'll also develop strong analytical and critical thinking skills. These abilities lend themselves well to careers in virtually any field. The myth that liberal arts majors can't find jobs after school is just that; a myth! WILL AN ONLINE ENGLISH DEGREE PROGRAM WORK WITH MY SCHEDULE? Online bachelor's in English programs offer a flexible alternative to traditional brick-and-mortar education. Students will be able to access course readings and lectures, participate in class discussions, submit written assignments, take exams, and communicate with their professors from home. Current e-learning technology also allows them to study on the go using a laptop, tablet, smartphone, and other devices with Wi-Fi capabilities. WHAT JOBS CAN I GET WITH MY BACHELOR'S IN ENGLISH? Again, it really just depends what you want to do. If you want to become an English teacher, you'll need a teaching license. If you want to work in marketing, your analytical and critical thinking skills will surely be an asset in most agencies. If you want to work in SEO, your reading and writing abilities will be more than adequate preparation. And of course, you can pursue traditional careers in publishing, journalism or digital media as well. 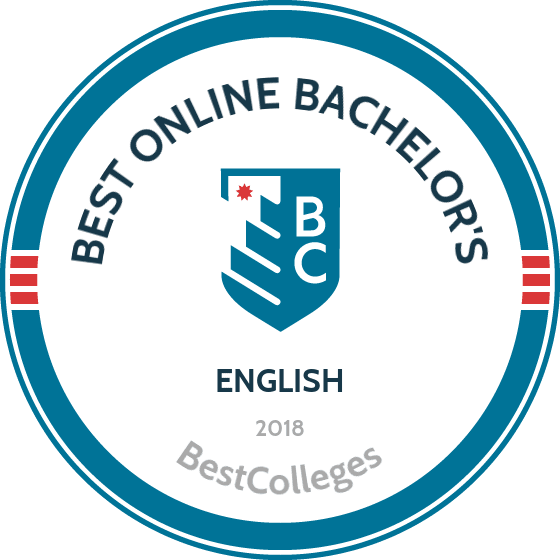 WHAT ARE THE BEST ONLINE BACHELOR'S IN ENGLISH PROGRAMS? Choosing a program is a very personal decision, and only you can properly evaluate whether a target school's strengths match your educational needs. The following ranked list of schools should serve as a helpful starting point in your search for the best online English programs in the United States. If you want to study English, and you value the opportunity to take classes online, read on to learn more about the top online English programs in the country. Located in Orlando, UCF is one of the largest universities in the country. The school is home to 64,000 students and is made up of 13 colleges. UCF’s online English degreeis housed in the College of Arts and Humanities. English majors have the opportunity to specialize in one of three tracks: creative writing, literature, or technical communication. The creative writing track introduces students to the craft through the study of fiction, poetry, and non-fiction prose, and assists them in producing their own creative texts. Within the literature track, students develop the ability to read discerningly, think critically, and write clearly. Finally, the technical communication track prepares students to fill the communication needs of the business and scientific community. A degree in English prepares students for careers in consulting, copywriting, journalism, publishing, and much more. Students seeking to complete their degree online at UCF should qualify for transfer student admission if most of their general education coursework is already completed. Baccalaureate graduates are required to take 120 total credits, which includes three semesters of a foreign language. Online support services include access to the university's library resources, a writing center that offers real-time consultation with tutors, financial assistance, academic advising, and student success coaching. Due to state regulations, students in certain states may be restricted from UCF enrollment. One of the best online English degree programs is also one of the most affordable. The university’s E-tuition begins at $304 per credit for all online students, regardless of residency. The online English degree is a completion program designed for students with prior credit. Applicants must have at least 30 lower division course credits; 60 transfer credits or an associate degree are ideal for meeting general education requirements. A minimum GPA of 3.0 is preferred, but not required. Additional eligibility requirements include two completed English composition courses and two completed lower-division literature courses with a grade C or better. The program does not admit students during the summer semester, and the deadline for fall admissions is March 1. Students must submit an online application and required materials by October 1 for spring admission. The online bachelor’s degree offers a concentration in English literary studies. This 34-credit sequence analyzes literary theory and research methods. Students complete 12 credits in literature courses that cover American, British, and world literature. The program’s specialty courses explore linguistics or student selected topics. The English degree online helps students develop critical thinking and writing skills that are beneficial in a variety of fields. The online platform allows students to establish a network with peers and professors that promotes professional growth, and the program’s curriculum prepares students for graduate studies. Distance learners have access to many of the same amenities that on-campus students enjoy, including tutoring services, IT support, and more than 85 student clubs and organizations. Courses are delivered through Blackboard. Located in Trenton, New Jersey, Thomas Edison State University offers an online English degree that introduces students to advanced writing, literary analysis, genre, and literary devices, and reinforces three principles of composition: research methods, argumentation, and grammar. To earn Thomas Edison State's online English degree, students complete 120 credit hours including 60 general-education requirements, 27 electives, and 33 English courses (e.g., African-American literature, Elizabethan drama, women in literature, Milton). All majors also complete a three-credit capstone. Graduates of this program go on to work in a variety of positions and study English at the graduate level. Transfer students at Thomas Edison State can transfer up to 80 credits from a two-year regionally accredited college or university. Even more impressive, students can transfer up to 117 credits from a four-year regionally accredited college or university. Thomas Edison’s website includes an online tool that helps transfer students determine which of their courses will transfer. Arizona State University-Tempe’s College of Liberal Arts and Sciences offers an online bachelor’s degree in English literature with no on-campus requirements. Students who complete this degree are prepared to work in a variety of careers because of the communication, problem-solving, research, leadership, and teamwork skills they've acquired. To graduate with ASU's online BA in English, students need to complete 120 credit hours, 39 of which should be English courses. Majors also have the option to pursue a three-year fasttrack version. What's more, the same faculty members who teach on campus also teach online, and students work through the same curriculum. Instructors in this college include three Nobel Laureates, a MacArthur fellow, and a Pulitzer prize winner. ASU welcomes transfer students, with nearly 25,000 pursuing degrees online. It also accepts up to 90 transfer credits from a regionally accredited college or university. Students need a minimum 2.0 cumulative and major GPA to graduate. To be admitted to ASU’s English program, applicants should have a high school diploma or GED and a minimum 2.5 GPA (if they have earned fewer than 24 credits). California Baptist University, based in Riverside, California, offers online programs that provide a quality education with a Christian foundation. The school's English degree online program helps distance learners develop essential skills like problem solving, literary analysis, and reading comprehension. The program covers British, American, and world literature, including Christian values in literature. One of the program's unique goals is to equip students to approach, read, and analyze literature from a Christian perspective. Students enrolled in the online English degree have access to personal advisors and an interactive online community that encourages cooperation and collaboration between students. CBU's online English program works to connect students with professionals and mentors in the field. Students must complete 48 credit hours, 12 lower division, 30 upper division, and six related to Christian thought. All students must take an overview of the Bible and foundations of Christian thought. Required lower division courses provide an introduction to different types of literature and writing. Upper division courses include multicultural literature, Shakespeare, and children's literature. Students end the program with a three-unit capstone project. In order to enroll in the capstone, students must have the recommendation of their program advisor and the approval of the department chair. Students can complete the degree in 16 months. The program has two prerequisite courses: composition and intermediate composition. CBU prefers that incoming students have at least 24 transferable units, although they'll accept applicants with a high school diploma or GED. A minimum 2.0 GPA is also required for admission. Online tuition costs are the same regardless of a student's residency status. The Baptist College of Florida, located in Graceville, is currently the only college to operate with the direct support of the Florida Baptist Convention. The college offers an online bachelor's degree in English literature that introduces advanced literary theory topics in the context of fundamental Christian thinking and values. Graduates are equipped with the knowledge and skills necessary for Christian service and the pursuit of an advanced degree in English. The English degree online is 120 credits, and the curriculum is divided into four areas: general education foundation, Biblical/theological foundation, major coursework, and electives. Students complete 33 credits in English courses that focus on writing styles, literary periods, composition, and linguistics. In addition to courses that cover conventional topics such as American literature, students complete coursework that incorporates Christian perspectives on writing and literature. Topics include writing about spiritual experiences and Oxford Christian writers. The general education foundation provides students with a well-rounded education, and students complete three specialization courses as part of the general core requirements. These include three humanity credits, a survey of world literature, and information technology applications. The English degree requires 18 credits in Biblical and spiritual studies, and students receive instruction in several areas, including spiritual formation, Christian philosophy, and evangelism. Courses are taught by experienced faculty with diverse research interests, such Victorian literature, the Christian faith in science fiction, and advanced grammar. The university’s distance education learning management system provides students with access to course material 24/7 and fosters direct communication between students and faculty members. Online coursework is asynchronous, and students complete assignments at their convenience. Students interested in earning their online degree in English can apply here. The affordable online tuition begins at $210 per credit for in-state and out-of-state students. With more than 450 online courses to choose from, UCD combines a quality education with flexible learning options to provide students with a challenging and rewarding academic experience. This 120 credit online English degree boasts a student-to-faculty ratio of 17:1, ensuring that students get personalized attention from their professors. The program emphasizes creative thinking, critical analysis, and scholarly writing. The online format promotes the development of time management skills and the ability to work independently. Graduates can pursue a variety of careers, including governmental grant writing, business copywriting, and editing. The curriculum focuses on advanced rhetoric analysis and language theory. In addition to general education courses, students complete 39 credits in English courses. Online courses cover a variety of areas, including multimedia composition and business writing. Special topics include cross cultural communication and the rhetoric of food. The English degree online participates in the university’s experiential learning model, and students have the opportunity to participate in English internships. This opportunity allows students to gain valuable professional experience prior to graduation, and students have interned in areas such as publishing, public relations, and teaching. To be eligible for the internship program, online English majors must have a GPA of at least 2.75 and completed 15 credits at UCD, including a major course. Students typically dedicate 10-25 hours per week to their internship site. Online courses are delivered through Canvas, and students have access to course materials 24/7. The online learning platform affords numerous benefits, including networking opportunities, peer support, and increased instructor accessibility. Students who are not residents of Colorado can still qualify for discounted tuition rates. Instruction style: Asynchronous and synchronous, 15 credits must be earned in-residence at the Denver Campus. Students interested in online English degree programs might look at Ottawa University's online bachelor’s of arts in English. The degree features a heavy writing component and teaches students how to evaluate, analyze, and understand English literature across a range of periods, genres, and authors. There are no on-campus requirements for this program. English courses at Ottawa cover topics from protest literature to creative writing literature of personal discovery to advanced expository writing. Students take two seminars, three surveys, and a four-credit capstone course. What's more, the 124-credit degree is technology-focused, teaching learners how to develop written content for various multimedia formats. Finally, English majors at Ottawa also have the option of adding to their program a 20-credit minor in fields such as marketing, theology, human resources, and business administration. Ottawa is a private, non-profit university that focuses on the liberal arts from a Christian perspective. Its generous transfer credit policy allows students to transfer up to 80 credit hours from previous study towards the BA in English. Many graduates of the program further their education by pursuing master’s degrees or teaching certification. UMass Online offers 139 degree and certificate programs, almost all of which are available completely online. Students can earn an online bachelor's degree in English literature and writing through the Lowell campus's Division of Online and Continuing Education. The coursework is available entirely online, and students examine traditional genres and styles while being encouraged to create and improve upon their own writing. Students complete 120 credits, including general education coursework. The English major requirements consist of five core areas, including courses on American and British literature, influential authors, theories of composition and linguistics, English electives, and a capstone course. To fulfill capstone course requirements, students are required to complete a 4000-level English course, such as Shakespeare or introduction to literary theory. Students complete at least six elective courses and can earn up to 36 elective credits toward their degree. Topics range from contemporary women writers to science fiction and fantasy. Students have the opportunity to enhance their writing skills in a number of areas, including technical and scientific communication, mystery writing, and personal and reflective writing. The online curriculum contains foreign language and world-ready tracks that expose students to Lowell's seven Essential Learning Outcomes, a fundamental part of every degree at the school. The online degree in English approaches the study of literature through a contemporary lens and encourages a lifelong practice of writing and research. Students interested in the program must submit high school transcripts, GED or HiSET scores, and complete an online application. The university offers a step-by-step guide to applying online, and a student support specialist is available to assist students as they transfer credits and develop their program plan. National University offers many programs completely online, including an online English degree. This program uses interactive learning tools like e-mail, digital lectures, and online readings to create an engaging and flexible online learning experience. Graduates pursue careers in teaching, advertising, writing, and related fields. The university offers two online English degrees: a bachelor’s degree and a BA/MFA transition program. The bachelor’s degree is 180 quarter hours and emphasizes critical thinking and communication skills. The major curriculum focuses on four key areas: literature, composition, linguistics, and communication studies. Students complete nine English core courses with topics ranging from American and British literature to literary theory. The program offers cultural courses on U.S. Latino, gender, and African American literature. These courses examine a variety of literary themes, including topics on diversity, gender expression in literature, and historical influences. Students complete seven elective courses, including film as art, interactive storytelling, and origins of English. Students can concentrate in creative writing and complete eight courses that cover topics like poetry, screenwriting, and contemporary fiction. The concentration offers a unique nature writing course that examines the natural world through creative expression. The program includes a capstone course that requires students to complete an eight week practicum in which they reflect on their writing and develop a research topic. Students complete a scholarly paper that examines the research topic and critique their paper as well as their peers. Students who have a 3.0 GPA or better and who are within six courses of completing the bachelor’s degree requirements qualify for the BA/MFA transition program. The University of Memphis offers a bachelor's degree in English that can be completed entirely online. It is one of the most popular programs at the university and features two concentrations: African American literature, which focuses on analytical reading skills and critical thinking; and professional writing, which helps students develop their communication and professional skills. Online students can pursue both tracks. The online English degree is 120 credits and can be completed in four years. The curriculum consists of general education and major requirements. General education courses include science and math. Students complete six hours in a foreign language and three credits in a fine arts course. Core requirements for both concentrations include courses in American and British literature. Students complete a core elective course in persuasive writing or advanced composition. The African American literature track offers a third elective course in linguistics. Students complete 12 credits in this concentration with courses covering African American literature before, during, and after the Harlem Renaissance. The curriculum also reviews many notable African American authors. Students of the professional writing track complete nine core credits that include topics like technical and professional writing and web design/online writing. Distance learners have the opportunity to pursue an internship in professional writing. The online degree in English offers several advantages to students, including flexible courses taught by experienced instructors, the convenience of completing assignments at home, and 24/7 access to course materials. UofM Online provides a variety of support services. Online students have full access to library services, including online catalogs and InterLibrary Loans, and the school provides an online chat system that directly links to on-campus librarians. Students can use Focus 2, an online assessment tool that gauges your academic and professional interests. Indiana University-East in the town of Richmond, Indiana, is comprised of eight campuses and an online division that features more than 100 online programs, including a degree-completion offering in English. Students receive unlimited storage space through Box and access to IUware. The online service, IUware, grants students access to various software programs from companies such as Microsoft, Adobe, Thomson Reuters, and more. Online tutoring and technical support help is available as well. The online English degree emphasizes technical and professional writing and is intended for students who have already completed at least 60 semester hours. Technical & professional writing teaches students how to effectively communicate and prepares graduates for careers in a wide range of fields. Students who enter the online English degree with 60 semester hours of undergraduate coursework (earned with at least a 2.0 GPA) can complete the program by taking an additional 60 credits (20 courses). The completion program takes two years. Each student is assigned an academic advisor who helps them determine a program plan. Students can take 12 credits in fall and spring terms and six credits during the summer session. Required courses span topics like technical editing, digital writing, and a senior seminar. Students must earn a grade of 'C' or better in all English composition courses and must complete ENG W131 within the first 25 credit hours they are enrolled. They must also complete a second writing course with a grade of 'C' or better within their first 50 credit hours. Located in San Marcos, Texas, Texas State University enrolls more than 38,000 students and offers nearly 100 bachelor’s degrees including an online BA in English. Texas State's 120-credit bachelor’s of arts in English requires students to complete 42 general-education credits and 36 credits of English courses such as British Victorian period, literature of the Southwest, women writers of the Middle Ages, and modern English syntax. Electives and minor credits fill out the rest of the program. Undergraduate English majors at Texas State choose an approved minor, and they can either pursue a general education degree or concentrate in creative writing, film, or writing and rhetoric. Another option is to major in English with a teacher certification in English language arts and/or reading (grades 7-12). Transfer students at Texas State can transfer up to 66 lower-level credits from at another institution. Students also may be able to receive additional credit for upper-level credits earned at a four-year college or university; however, 25% of the required upper-level credits must be completed at Texas State. Texas State University receives accreditation from the Southern Association of Colleges and Schools. Southwestern Assemblies of God University in Waxahachie, Texas, was founded after a merger between three religious schools in Texas. The Christian school is accredited by the Southern Association of Colleges and Schools Commission on Colleges. SAGU offers a variety of programs online, including one of the best online English degrees. The online english degree program is available completely online. Courses for the online English degree are taken in three major groups: literature, writing, and TESOL (teaching English as a second language). Literature classes include modern American authors, Christian thought in literature, Bible as literature, and the Victorian period. Scriptwriting for theatre and film, writing and publishing poetry, and writing and publishing long fiction are among the writing courses. TESOL courses include cross-cultural communication and the EFL classroom, morphology and syntax, and sociolinguistics. Major courses include introduction to literary theory, introduction to linguistics, and advanced grammar and composition. Students can earn credit by demonstrating work experience and knowledge. The experiential learning credit allows students to enroll in a three-credit course and potentially earn up to 45 credit hours. It's possible that this opportunity could save up to $25,000 in tuition. SAGU also has three learning centers dedicated to math, writing, and achievement, which feature online workshops and tutoring services. Applicants must be 22 years or older and hold a high school diploma with a 2.0 GPA or have earned a GED. Applicants must submit official high school and college transcripts. Students who do not meet these requirements may be considered for admission on a case-by-case basis. Online students pay the same tuition rate regardless of their residency status. Based in Manchester, SNHU offers more than 100 regionally accredited bachelor's programs, including an online bachelor’s degree in English literature. Coursework is divided into six nine-week terms, and the asynchronous format allows students to complete assignments at their convenience. The online English degree provides a foundation for students who wish to earn advanced degrees. The program prepares graduates to work as writers, museum curators, editors, and more. In addition to gaining a broad foundation in historical and modern literature, the online English degree familiarizes students with contemporary critical theory, such as Marxism and feminism. Students learn how to examine literary works through the lens of these theories. The curriculum consists of 120 credits, and students complete coursework in general education and major courses. General education courses provide students with a broad liberal arts foundation and cover subjects ranging from arts and humanities to math and social science. The major coursework emphasizes knowledge in literary theory, linguistics, and writing. Students choose from four writing workshops: poetry, playwriting, fiction, and nonfiction writing. Students learn about Shakespeare and the Elizabethan era and have the opportunity to complete a senior thesis in literature. The thesis provides students with a graduate-level writing experience. Learners choose to explore a topic in American, British, or world literature and develop an academic paper of 40-60 pages in length. Students who do not wish to write a thesis can complete two 300-400 level literature elective courses. Online students can take advantage of the school's various assistance programs. Career services helps distance learners develop and pursue their professional goals, while academic advisors are on hand to help students plan their degree. The school's online writing center provides feedback and tutoring help on assignments. Located in Ellensburg, Washington, Central Washington University offers an online BA English with a focus on professional and creative writing. The program combines \ a liberal arts and literature foundation with business, professional, creative, and scientific/technical writing. CWU’s 180-credit bachelor’s of arts in English requires students to complete 74 credit hours towards the major, which includes 32 required major credits, 27 writing electives, and 15 credits of film studies, literature, and linguistics. Online students may also contribute their work to CWU’s student literary journal, and students in many states have the option to enroll in cooperative education. All students take a two-credit senior colloquium and one year of a foreign language (the language requirement is waived for students who took two years of a foreign language in high school). Online English students at CWU have a number of resources available to them including tutoring, career services, and technical and library assistance. Online learners are also eligible for the same types of financial aid as on-campus students. Transfer students can receive up to 135 credits towards the BA, with no more than 105 from a community college. Central Washington University is accredited by the Northwest Commission on Colleges and Universities. Clayton State University in Morrow, Georgia, offers an English degree online with three tracks--writing, literature, and secondary English education--to prepare students for graduate study or serve as a foundation for careers in journalism, editing/writing, and law. The 120-credit online English curriculum at Clayton State includes courses in teaching writing, Shakespeare, American literature, and critical theory. English majors also complete a seminar and internship in their last semester. Of special interest to online English majors is Clayton’s Writers’ Studio, which offers virtual assistance with any writing issues in the form of specially-trained peer consultants in half- to one-hour sessions. Students may schedule up to three hours of assistance from the Writers’ Studio each week. Distance learners in the English BA program at Clayton benefit from the same instructors and curriculum as on-campus students. That goes for campus resources as well: tech support, tutoring, advising, and library services. Online students receive a reduced eTuition rate, excluding fees charged to on-campus students such as parking and athletics costs. Finally, to be admitted to the BA in English program, transfer students need a minimum 2.0 GPA and a high school diploma or GED. Clayton generally accepts transfer credits from regionally accredited colleges or universities, as long as the student received a grade of C or better. Clayton State University is a public university with accreditation from the Southern Association of Colleges and Schools Commission on Colleges. UMUC offers more than 90 online degree, specialization, and certificate programs, including an online English degree. The fully online program is 120 credits and emphasizes analytical and communication skills. Applicants should already be capable communicators and presenters. These skills will benefit them throughout the program as they learn how to effectively share ideas and creatively convey meaning through the written word. The program’s innovative learning strategies include projects, such as creating a social media page for Shakespeare and exploring U.S. vernacular by mapping regional changes in pronunciation. Graduates are able to analyze and interpret the significance of literary works and use critical theory to strengthen their analysis. Graduates leave school prepared for further academic work and careers in education, public relations, journalism, and other related fields. This English degree online covers three core areas: general education, major courses, and electives. Major courses cover literature from various time periods, including the Renaissance, 19th century, and contemporary fiction. Students are familiarized with the history of the English language and standard English grammar. They learn how to become proficient, persuasive writers and develop skills in editing and communicating with diverse audiences. Students complete an advanced seminar in English language, literature, and writing. This capstone course requires learners to complete a research project or thesis that integrates knowledge and skills acquired throughout the program. UMUC recommends pursuing a minor in a related field, such as communication studies or marketing. UMUC offers a variety of online resources to students, including information sessions and webinars, where distance learners can learn more about a select topic or field. Nicholls State University, located in Thibodaux, Louisiana, offers an online English degree through its Department of Languages and Literature. Students pursue a concentration in literary studies, creative writing, or writing and rhetoric. The program begins with two foundational introductory courses: English 220 and 266. English 220 introduces students to the different concentrations in the program. English 266 equips learners with the writing skills needed to successfully complete their English degree online. Students must complete 120 credit hours. Students also take a variety of elective courses, including world literature, poetry, and film. In the last term, students complete a capstone course (English 405), which allows them to reflect on what they learned and explore career options. Graduates are prepared to enter master's programs. Online students take classes in an accelerated format, and learners who take three classes each session can complete the program in three years. Eight-week, asynchronous courses start in January, March, June, August, and October. The BA in English can be completed entirely online. Students must submit official transcripts and ACT scores. Applications take about one week to process, and students are welcome to apply for any term during the year. Students who have previously earned undergraduate credit may be able to transfer some to the English degree online. Out-of-state online students pay the same price per course as Louisiana residents. Students receive technical support and access to the online library and bookstore. Mercy College offers a fully online English degree. The 120-credit program prepares students for several career opportunities. Graduates have found jobs in writing, editing, radio, and entertainment. Aspiring teachers can major in English before pursuing their teaching certification through Mercy's Teacher Education Program. The online bachelor’s degree in English literature curriculum includes foundational courses in poetics and surveys of English literature. Students must also complete coursework in a variety of categories, including classical, social and cultural, genres, and historical. Each category offers several course topics to choose from, allowing students to tailor the degree to reflect their academic and professional interests. Classical course topics include the Bible as literature and Shakespeare in music and drama. The Social and cultural category allows students to gain perspectives on topics such as literature by women and Caribbean literature. The program covers a range of genres, including science fiction and modern drama. The study of literary historical periods familiarizes students with influential American and British literature. Students choose four language and writing courses that prepare them for professional writing roles. Students can study business writing, creative writing, writing for the web, and more. Distance learners have access to support services through the school’s online resources, such as academic advising, financial assistance, and career services. The English degree online offers qualified students the opportunity to pursue their master’s degree in English in an accelerated format. The four-plus-one program allows students to simultaneously pursue a master’s degree as they finish their bachelor’s program. Transfer students can apply up to 75 community college credits and up to 90 credits from a four-year institution. Chaminade University of Honolulu offers nearly two dozen online programs at the undergraduate and graduate level, including an online degree in English. Chaminade is the only Catholic university in Hawaii and one of just three Marianist higher-education institutions in the United States. Graduates will be prepared to continue studying English at the graduate level or for professional careers that require skill in writing and reading. Courses cover expository writing, English literature, and other topics. Students conclude their program with a senior seminar. Distance learners pursuing an online English degree are encouraged to pursue a specialization in either writing or literature & criticism. The degree requires students to complete 120 credit hours, which includes pre-major requirements, major requirements, and major specialization electives. Students must complete two prerequisite courses: expository writing and any 200-level English course. The three required major courses are backgrounds in American literature, backgrounds in English literature, and a senior seminar. Online education is conducted by the Office of Professional and Continuing Education. Courses are offered in an accelerated format. The school's standard calendar consists of four terms, each containing 10-week sessions. Chaminade has been accredited by the Accrediting Commission for Senior Colleges and Universities of the Western Association of Schools and Colleges since 1960. To apply, students must submit an online application, transcripts from all previously attended colleges, and high school transcripts (if the student has earned fewer than 24 college credits). Applications are accepted on a rolling basis. A public university in Alexandria, Louisiana, Louisiana State University-Alexandria offers numerous undergraduate degrees to distance students including an online bachelor’s of arts in English. The 120-credit online English program at LSUA teaches students literature, grammar, and composition as well as foreign languages, literary history, public speaking, poetry, and drama. Graduates of this program are generally ready for careers as writers, editors, English teachers, or communications professionals. Requirements include 39 general education credits, 39 major, 6 foreign language, and 36 electives. LSUA accepts up to 36 transfer credits towards the BA in English. LSUA has a flexible application process, and students can apply to and start the program seven different times throughout the year. To be accepted into the program, applicants need a minimum 2.0 GPA. While LSUA offers affordable tuition that's the same cost regardless of Louisiana residency, students are eligible for several financial aid opportunities. Louisiana State University-Alexandria receives accreditation from the Southern Association of Colleges and Schools Commission on Colleges. A private university affiliated with the Presbyterian Church and the Evangelical Presbyterian Church, King University in Bristol, Tennessee, offers a 100% online English degree. The school's online BA in English is a bachelor’s degree completion program, so students need to have at least 45 previously earned semester credit hours from an accredited college or university in order to be admitted. King’s English program focuses on helping students analyze and better understand English language and literature. Curriculum includes courses such as Appalachian literature, modern American literature, and religion and literature. At the end of the program, students compile a portfolio, which some graduates have found useful for showing prospective employers. Prior to graduation, all King undergrads take a pass/fail comprehensive general-education exam. A final component of this program is that students explore the relationship between their faith and the greater culture. To graduate with the BA at King University, learners must complete 124 credits, 48 (12 courses) of which must be in the major. As well, English majors need to achieve intermediate proficiency in a foreign language of their choice (students can fulfill this requirement by transferring foreign language credits or by completing online courses in either Latin or Spanish). The program is also designed to prepare students for secondary education licensure in the state of Tennessee. The online bachelor’s degree in English literature at Columbia College in Columbia, Missouri, provides a broad overview of English language and English literature, giving students critical thinking and communication skills valuable in industries from journalism and technical writing to education and government. English students at Columbia College take courses like ethnic traditions in American literature, advanced editing and revision, and readings in poetry. English majors also have the option to enroll in an English internship, which consists of 45 credit hours of experiential work. All students also take a senior seminar, which requires them to write and revise a literary studies argumentative essay that serves as their senior project. Admission to Columbia College's bachelor’s of arts in English requires a high school diploma or GED but no minimum GPA requirement. The school also generally accepts up to 90 transfer credits towards the 120-credit bachelor’s degree with at least 30 credits completed at Columbia. Columbia College is a private, non-profit college focused on the liberal arts and sciences and is located in Columbia, Missouri. A private institution in Township, Pennsylvania, Robert Morris University offers an English degree online with no mandatory campus visits or in-person components. While most students enrolled in this program live in the Pittsburgh area, online learners anywhere in the U.S. can enroll. RMU's bachelor’s of arts in English offers courses such as technical writing, technical editing, the study of rhetoric, and the study of language. Students must complete 120 credits including 39 core liberal arts, 12 departmental, 30 major, 24 concentration, and 15 electives. Graduates of this program go on to work in a variety of fields like editing, writing, public relations, and teaching. RMU offers support to distance learners in a couple of ways: first, its Online Student Services team helps students register for classes and ensures they are academically successful; second, its instructional design team creates online courses with faculty members in a way that encourages engagement and access to the correct technological tools needed for academic success. Help is also available from dedicated career advisors, financial aid counselors, and wellness counselors. To be admitted to Robert Morris' program, applicants need to have a minimum 2.0 GPA and a high school diploma or GED. Robert Morris University receives regional accreditation from the Higher Learning Commission. Earning an online degree in English provides a solid education in the liberal arts. Students learn the skills of analysis and composition that will be helpful in a wide variety of careers. Since English literature is such a broad subject, a student's course of study will vary depending on the program and concentrations chosen. British Literature: This survey course provides students the opportunity to read and critique the greatest works of English-language literature produced in Britain. This course covers “the greats,” like Shakespeare, Chaucer, Milton, and more. The course often includes an overview of British history as well, so students understand what major events British writers were reacting to in their texts. Poetry: Learn how to interpret poetry, whether it's a limerick, sonnet, haiku, or free verse. In addition to understanding the different formats and rhyme schemes poems can use, you'll also examine the literary techniques found in poems, like alliteration, onomatopoeia, similes, and metaphors. Drama and theater arts: Immerse yourself in the greatest works of drama written and acted in the English language. In addition to critiquing the text of plays, you'll also examine stage elements, like lighting, set design, and blocking (the positioning of actors on a stage), that can affect the interpretation of a play. This course often requires students to attend productions put on by the school or in the area. HOW LONG DOES IT TAKE TO GET AN ONLINE BACHELOR'S IN ENGLISH? Earning an online English degree typically takes two years if students are enrolled full time. It may take you longer to graduate with an online bachelor's degree in English literature if you must balance your studies with job or family responsibilities. Another factor influencing the length it takes to earn an online BA english degree is how a program is designed. If your online english degree program follows a cohort model, that means you and your peers must start the program at the same time and work through the program together at a set pace. While the cohort model provides a sense of camaraderie and community with your fellow students, it doesn't provide a great deal of flexibility. Many online courses can be worked through at your own pace, allowing you to complete courses more quickly and take more than one course at a time. As you explore your options for earning an online english degree, be sure to narrow your list down to schools that are accredited. Accreditation indicates that a school has met certain standards and delivers a quality education. The schools you consider will either be nationally accredited or regionally accredited. National accreditation is usually reserved for institutions of higher learning that focus on a specific type of education, like distance learning or vocational training. Regional accreditation is given to an institution that has met the standards of a regionally accredited association; there are six regional accreditation associations throughout the U.S. covering different regions. A degree from a regionally accredited institution is valid in any state. Schools offering you the opportunity to earn a bachelor's in english online are more likely to be regionally accredited. Accreditation associations work in tandem with other organizations to establish the standards that institutions of higher learning must meet. The Department of Education (DOE) approves accreditors deemed reliable by the Secretary of Education. The DOE can only provide financial aid to students who attend accredited institutions. Another organization related to accreditation is the Council for Higher Education Accreditation (CHEA). The CHEA advocates for self-regulation among accredited institutions of higher learning to maintain high standards. Over 3,000 colleges and universities are members of the CHEA. To learn whether a school offering an online english degree program is accredited, you can check the list of accredited schools on the websites of the DOE and CHEA. Traditionally, college graduates with English degrees have endured higher-than-average unemployment rates. A 2014 survey by Georgetown University's Center on Education and the Workforce (CEW) found that, from 2009 to 2012, the unemployment rate for experienced college graduates with an English degree ranged between 6.2% and 6.5%. A recent report from the NCES suggests that this trend for English degree-holders subsists, though employment prospects have improved slightly for this population; college graduates with an English degree between the ages of 25 and 29 now face a 5.9% unemployment rate. The table below compares unemployment rates for experienced English degree recipients against majors in other related fields. The NCES survey also found that English language and literature degree-holders between the ages of 25 and 29 earn an average annual salary of $39,510. However, due to the variety of career pathways you can take with an English degree, it's important to remember that your salary expectations stem in part from your degree specialization. Using data from the 2015-16 PayScale College Salary Report, the table below features median annual earnings for different English majors at two key career benchmarks. Of the seven degree fields listed in the table, English literature majors have the highest rate of career growth during their first 10 years on the job, with an 80.8% salary increase between the entry-level and mid-career stages. Most other specializations saw a salary increase of about 70%. Your major is just one indicator for your future career prospects, however. Salaries will also vary depending on your specific job title, as well as other factors like your location, and the size of your company. The next table highlights the career salary growth projections for five of the most common career pathways for English majors. Associate publishers had the highest rate of career salary growth, with a 102% increase between the entry-level and late-career stages. Journalists ranked second with a 74.9% earnings increase after 20 years in the workforce. The other three careers recorded healthy salary growth, as well, with writers and authors at 67.4%, technical writers at 51.1%, and editors at 47.3%. College students who leave school with a bachelor's degree in English will be qualified for dozens of entry-level positions in a variety of industries. Below, we covered four careers that many English majors pursue after they leave school. Writers and Authors: Writers and authors develop, compose, and edit content for various media platforms, such as books, magazines, movie and television scripts, songs, and online publications. Their work often includes extensive background research through reading, interviews, and site visits. Many of these professionals work on company writing staffs, while others are employed as freelancers. Technical Writers: Technical writers compose content used in manuals, brochures, guides, and other materials that explain complex information. They study and evaluate various products and services before producing descriptive copy, and they use consumer feedback to modify their future output. Advertising, Promotions and Marketing Managers: These professionals oversee product launches, marketing campaigns, and other promotional activities designed to boost public interest in various goods and services. Their job includes meticulous research into consumer demographics and trends, market activity, and other factors that affect the way products are bought, sold, and advertised. Interpreters and Translators: These professionals use their bilingual skills to translate written or spoken words from one language into another. Many interpreters and translators working in the U.S. specialize in one commonly spoken second language, such as Spanish, French, Chinese, or Japanese. Jobs in this industry are expected to soar in the coming years; the BLS projects that these positions will grow by 29% between 2014 and 2024. Making connections and learning all you can about your industry of choice is critical to your professional development. Professional organizations offer a great entry point for students who want to learn more about their chosen career path. Below you'll find three of the country's most prominent organizations established for professionals with a background in English. These organizations host networking events, provide online trainings, maintain active job boards, and offer other services for career-ready college graduates. Society of Professional Journalists: Founded in 1909, the SPJ today represents roughly 7,500 members nationwide. The organization's flagship magazine is published 10 times per year, and the website features jobs leads, professional development courses, and an extensive resource library. Association of Writers and Writing Programs: The AWP offers membership, career resources, and advocacy to writing professionals across the country. The organization represents more than 550 college writing programs and 150 national writers conferences. Society of Children's Book Writers and Illustrators: This organization offers training, grant support, and advocacy for writers and illustrators that produce work for young audiences. The SCBWI maintains more than 80 local chapters across the globe.